On Saturday, February 11, thousands of prolifers gathered nationwide for Defund Planned Parenthood rallies. Altogether, 228 rallies were held in 45 states. The purpose was to publicly call on Congress and the President to stop all federal funding of Planned Parenthood and instead, make those funds available to health centers that help women without destroying children through abortion. If you’d like to read more and know how to talk to others, the Protest PP site has some helpful statistics and Q&As. I’ve written about Planned Parenthood’s roots in the eugenics movement, which explains why to this day they do virtu­ally nothing to promote adoption or help poor and minority women who choose to give their children life rather than abort them. I’ve also written about the undercover videos done to expose their sale of baby body parts for profit. Those are just some of the many reasons why we all should support efforts to federally defund their organization. I was glad I went to the rally, but I was very drained and troubled afterwards. I came home distressed, and cried for all the angry, deceived, and hurting people there who, for whatever reasons, don’t understand the preciousness of life. 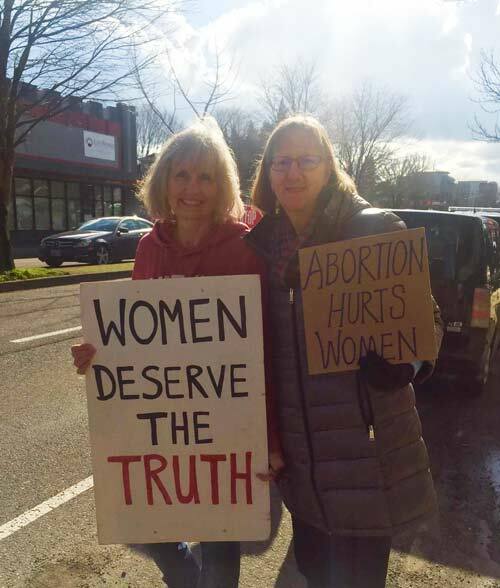 I had made a sign—Abortion Hurts Women—and as we walked past the proabortion protestors, a woman hissed at me, “How do you know? Have you had one?” We took a place on the sidewalk just past the Planned Parenthood entrance. The prolife people were quiet. The proabortion people were chanting their slogans loudly, some angrily. One of our signs was a large “Planned Parenthood Deceives Women” banner. When a proabortion protestor read the sign, she stepped in front of it to prevent people in the passing cars from reading it, but we quietly moved further down the sidewalk. In reality, that makes me want to go back again! Kathy held a sign reading “Women Deserve the Truth” and looked for opportunities to engage people in peaceful conversations. She later reported a calm dialogue with a woman who worked for Planned Parenthood, and later with a young Buddhist named John. She shared the Gospel with him and encouraged him to read the book of John. The EPM staff prayed for him in our prayer meeting a few days later. I saw a middle-aged man of Asian descent with a “Stop Abortion Now” sign in the shape of a stop sign. He appeared to be alone. As we were getting ready to leave, I thanked him for coming. He said he felt a little out of place because he was visiting from Los Angeles, and would have gone to the Planned Parenthood there if he’d been home. How great he found this one and just showed up. A young couple with numerous piercings and wearing black clothing came up and interrupted us. The woman had a bandanna over her nose and mouth and started rattling off something so fast I couldn’t understand most of it. She was also laughing, but I caught “my lord and savior Satan Lucifer.” The man from LA waved them off. As Kathy said on the way home, this battle is only going to be won on our knees. She commented how there’s something strengthening about being a light in the darkness, standing for truth in a hostile environment, and having the opportunity to be Christ-like to those who oppose you. It’s a privilege to identify with Christ by experiencing this extremely small persecution. The proabortion people outnumbered the prolife people at these nationwide rallies by huge numbers. Here’s a shortened version of an email from Pro-Life Action Ministries, who spearheaded the rallies, which presents a good perspective for the future. What happened? Our numbers were reduced because of a warning I believe needed to be made. In the week prior to the competing rallies, we learned that energy from the “Women’s March” (about 60,000) a few weeks earlier was driving a large counter-protest of our rally. 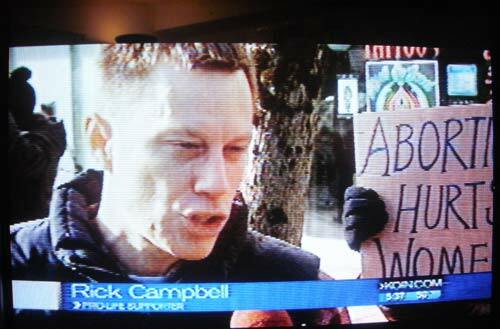 Knowing that some of those who would be counter-protesting would be vulgar, profane, and obscene, I felt it my duty to warn parents of small children. And since most attendees of our events are families, this warning may have more than cut in half our numbers (there were almost no children present at our rally). Lesson 1: We are not engaging in a numbers game. We are engaging in peaceful and prayerful efforts to save as many defenseless babies from being killed by abortion as possible until the day our Christian witness brings an end to abortion. By virtue of this, “…our struggle is not with flesh and blood but with the principalities, with the powers, with the world rulers of this present darkness, with the evil spirits in the heavens” (Ephesians 6:12). We must be present regardless of who has the larger turnout. Lesson 2: When we “win” a presidential election, our people let up, while the supporters of abortion become energized. Though they become even more energized when they believe they are losing something, too many of us sit back and relax. Hey we won, didn’t we? Well we haven’t won. Even with President Trump’s fast-paced moves that impact the abortion industry, the actual numbers of babies being killed each day in this country has not been impacted. More directly, unless we push harder than ever before, the efforts to defund Planned Parenthood have as much a chance to fail as prevail. Lesson 3: This is a glimpse of things to come if we truly threaten the status quo of Roe v. Wade. A clear, sober assessment of how things will play out in this country needs to be made if we move toward making abortion itself illegal again. Those who profit from abortion will stir up those who believe they are losing something they deserve, and their numbers will grow even more. Lesson 4: We must be courageous! Time and time again Jesus teaches us that “fear is useless,” “be not afraid,” and “take courage.” Well, this seems to be the time to learn what this means in our contemporary culture. We cannot and must not back away because they come out with large crowds. Our efforts must remain peaceful and prayerful. We must go out and proclaim the truth while offering the mercy and love of God to those who despise us. And we must defend the defenseless and speak for those who cannot speak for themselves. What a great opportunity God has given us! The more that we encounter, the more opportunities we have to display Christian character in the face of adversity and speak with compassion to those who so seriously dislike us. All in the name of Jesus. Last thoughts: Our prayer events these past decades have been largely attended by families with small children. If you ever are concerned that your children will see and hear things you are not prepared to deal with or simply want to shield your children from, then please find others to watch your children and still attend yourself. There are always those in our churches and families who do not yet go out to these prayer events. Ask them to babysit, but attend yourself. And let us all pray as never before!